When to Reteach Behavior Expectations? Is it taking longer for your students to respond to the signal for quiet? Has lunchroom behavior taken a turn for the worse? Are you feeling frustrated because students aren’t cleaning up as thoroughly now as they did in September? Although most teachers normally reteach behavior expectations after winter break or spring break, sometimes a behavior reboot is needed sooner. 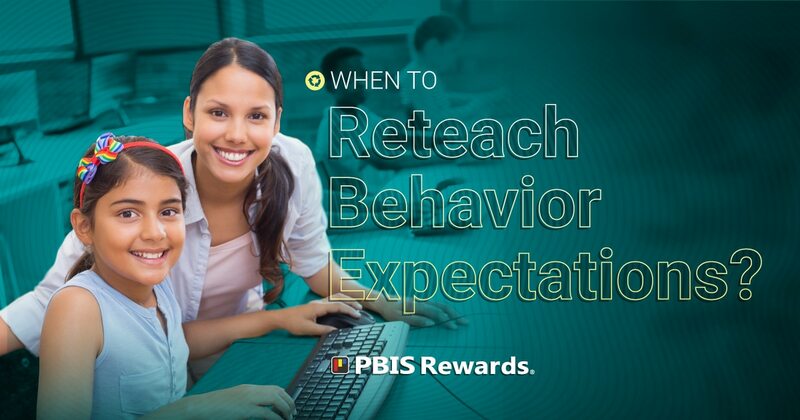 Obviously, reteaching behavioral expectations can bring huge benefits to your classroom. Before your students get too far away from classroom routines, taking the time to revisit expectations will help things run more smoothly. Smaller corrections now can save you a great deal of frustration later in the year. It can also help the shorten the amount of time you spend reteaching expectations after winter or spring break. At a basic level, reteaching means teaching content again that students have failed to learn. It might be apparent that your students have slipped away from expectations. Are you finding it hard to get through classroom lessons because of time wasted on settling into class routines? Are you writing more major/minor office discipline referrals? Ultimately, you probably have an idea that a refresher is in order. Before reteaching, consider breaking down each expectation into progressive targets. Understand exactly where your students currently are on that progression. Finally, think about how you can clearly communicate your reteaching in student-friendly terms. One of the best ways to begin is to use a positive and engaging reason to establish a common need and benefit for reteaching. It might be tempting to just restate expectations and move on, but for most students, modeling and practicing gets the message across effectively. State the behavioral expectation and the routine associated with it. Then, ask for a volunteer to demonstrate the routine as you practiced it at the beginning of the year. Next, let students share what they noticed. Be sure that they pay attention to the “tricky” parts—voices off during lining up, quick and neat clean-up of materials during a transition from desks to the circle, or a quick response to the signal for quiet. Classroom management is essential from the first day of school to the last. Beginning the year with positive routines and expectations will help you to maintain order and allow your students to develop as the year progresses. In fact, the presence of expectations and routines can help increase instructional time, so that your students can learn more! Still, as you and your students become comfortable with each other, it can be easy to fall away from these expectations. Reteaching behavior expectations helps to get everyone focused again. It’s important to make re-teaching positive and to convey your firm belief that students can improve. While belief alone will not change student behavior, consistently demonstrating your faith that students can and will meet your expectations really does make a difference.